1Millennials are the largest adult generation in the United States, but they are starting to share the spotlight with Generation Z. This year, Millennials, those ages 23 to 38, will outnumber Baby Boomers (ages 55 to 73), according to Census Bureau projections. Now in their young adulthood, Millennials are more educated, more racially and ethnically diverse and slower to marry than previous generations were at the same age. But after growing up in the Great Recession, their economic picture is mixed: Young adult households are earning more than most older Americans did at the same age, but have less wealth than Boomers did at the same age, partly because they are more likely to have higher amounts of student loan debt. Although the nation’s 73 million Millennials are the largest living adult generation, the next one – Generation Z – is entering adulthood. Also known as the post-Millennials, Gen Zers (those ages 7 to 22 this year) are on track to be the best educated and most diversegeneration yet. Nearly half of Gen Zers (48%) are racial or ethnic minorities. Socially and politically, their liberal-leaning opinions on key issues are similar to those of Millennials. 2Hispanics are projected to be the largest racial or ethnic minority group in the U.S. electorate when voters cast their ballots next year. The number of eligible voters who are Hispanic (32 million) is projected to surpass that of black eligible voters (30 million) for the first time, according to Pew Research Center projections based on data from the U.S. Census Bureau. However, voter turnout will play an important role in the influence of different racial and ethnic groups. In past elections, black voter turnout substantially surpassed Hispanic voter turnout. The projections indicate that whites will account for two-thirds of the electorate, a declining share. 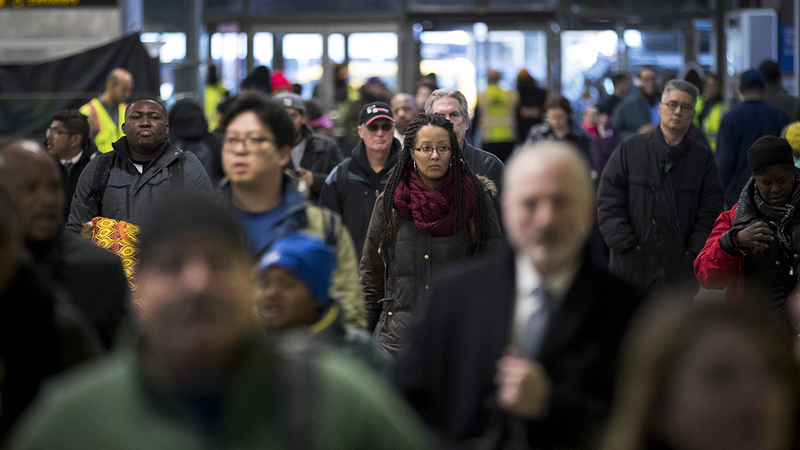 As the nation’s demographics are changing, so are those of Congress, though not as rapidly, according to a February 2019 Pew Research Center analysis. Nonwhites have risen to 22% of Congress, and women are a record 24% of voting lawmakers (a share that matches the average in legislatures worldwide). The share of immigrants in Congress has ticked up, but at 3% remains short of historical highs and far below the foreign-born share of the total U.S. population (13.6% as of 2017). An influx of younger representatives is having a small impact on the median age of the House of Representatives, according to a November 2018 analysis. 3The American family continues to change. A growing share of parents are unmarried. Among parents living with a child, the share who are unmarried increased from 7% in 1968 to 25% in 2017. Part of this increase is due to a growing share of unmarried parents cohabiting, as 35% of unmarried parents were in 2017. Over the same period, the share of U.S. children living with an unmarried parent more than doubled, from 13% in 1968 to 32% in 2017. Stay-at-home parents account for about one-in-five parents (18%), which is roughly similar to 25 years ago, despite some fluctuation in the intervening years. For some parents, caring for a child isn’t their only responsibility: 12% of all parents with a child younger than 18 at home are also caring for an adult. Lifetime fertility for women is ticking up. The share of women at the end of their childbearing years who have ever given birth is rising and is now similar to what it was in the early 1990s. While American women are having their children later in life than in the past, they are still doing so earlier (and have more children) than women in many other developed nations. Americans generally see change on the horizon when it comes to the future of the family, according to a Pew Research Center survey. A majority of Americans (53%) say that people will be less likely to get married in the year 2050, and 46% say people will be less likely to have children than they are now. Even today, 71% of parents younger than age 50 say they are unlikely to have more kids in the future, while 37% of childless adults of the same age say they are unlikely to ever have kids, according to another survey by the Center. 4The immigrant share of the U.S. population is approaching a record high but remains below that of many other countries. The 44 million foreign-born people living in the U.S. in 2017 accounted for 13.6% of the population, according to a Pew Research Center analysis of the American Community Survey. That is the highest share since 1910, when immigrants were 14.7% of the total population. The record share was in 1890, when immigrants were 14.8% of the total. According to United Nations data, 25 nations and territories have higher shares of immigrants than the U.S. 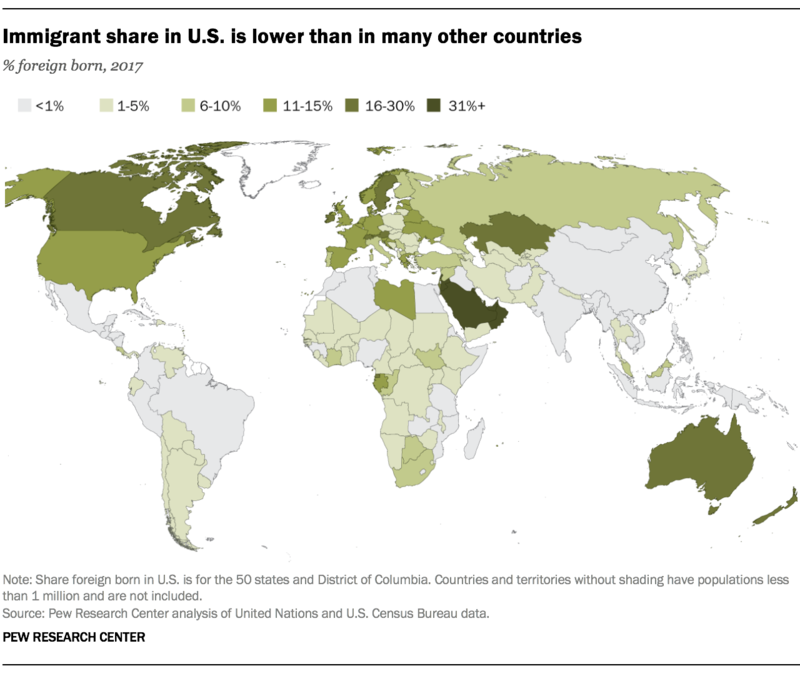 They include some Persian Gulf nations with high shares of temporary labor migrants, as well as Australia (29%), New Zealand (23%) and Canada (21%). The role of the U.S. in accepting refugees has diminished, according to an analysis of data from the United Nations High Commissioner for Refugees. The number of refugees resettled in the U.S. – 33,000 in 2017 – decreased more than in any other country over the previous year. The same year also marked the first time since the adoption of the 1980 U.S. Refugee Act that the U.S. resettled fewer refugees than all other countries combined (69,000). In most top destination countries for migrants, majorities of people say immigrants strengthen their countries rather than burden them, according to a 2018 Pew Research Center survey of 18 countries that host half of the world’s migrants. Immigrants were viewed positively in 10 of those nations, including the U.S., Germany, the United Kingdom, France, Canada and Australia. Majorities in five countries viewed immigrants as a burden: Hungary, Greece, South Africa, Russia and Israel. 5The U.S. unauthorized immigrant population is at its lowest level in more than a decade. There were 10.7 million unauthorized immigrants living in the U.S. in 2016, the lowest total since 2004, according to the most recent Pew Research Center estimates. The decrease is due mainly to fewer Mexicans entering the U.S. without authorization. The only birth region with an increase in unauthorized immigrants since 2007 was Central America – mainly El Salvador, Guatemala and Honduras. Only three of the nation’s 20 largest metropolitan areas had larger unauthorized immigrant populationsin 2016 than in 2007. State populations of unauthorized immigrants vary widely. In some states, unauthorized immigrants represented one-third or more of all immigrants in 2016; in others, they accounted for less than one-in-ten. Nationally, unauthorized immigrants are one-quarter of all U.S. immigrants. The Mexican share of unauthorized immigrants also ranges widely, making up more than two-thirds of the total in the four states that border Mexico but far less in East Coast states. Nationally, Mexicans are about half of unauthorized immigrants. As with the total population, births to unauthorized immigrants have declined since 2007. About 250,000 babies were born to unauthorized immigrant parents in 2016, a decline of 36% from 390,000 in 2007, when the nation’s unauthorized immigrant population peaked. 6Incomes are rising in the U.S., but the increase is not being felt equally by all Americans. Household income in the U.S. is at or near the highest level it has been in the last 50 years. At the same time, income inequality continues to grow, and the growth has been more pronounced among some racial and ethnic groups than among others. For example, the gap between Asians at the top and bottom of the income ladder nearly doubled between 1970 and 2016. Over that period, Asians went from being one of the groups with the lowest income inequality to the highest. A separate analysis found that, among Hispanics, the median income of foreign-born workers – but not U.S.-born workers – had returned to its pre-Great Recession peak in 2017. The share of Americans who are in the middle class has fallen over the last several decades. About half (52%) of adults were considered middle class in 2016, down from 61% in 1971. The share of adults in the middle class has stabilized around half since 2011. Meanwhile, median incomes have grown more slowly for middle-class households than for upper- or lower-class households.